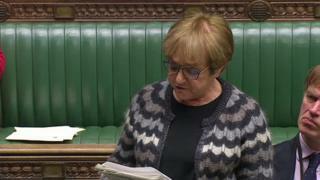 An MP has apologised to the Commons and repaid £2.97 after she was found to have breached Parliament’s code of conduct. Dame Margaret Hodge offered a “sincere” apology for “inadvertently” breaching the rules over her review of the London Garden Bridge project. An inquiry said the Barking MP should not have used Parliamentary resources for the review. The £2.97 repayment was the cost of House of Commons stationery, she said. The code of conduct states MPs should use public resources only “in support of parliamentary duties”. The inquiry concluded the review had not been carried out as part of Dame Margaret’s parliamentary activities, because it had been commissioned by an outside body for its own purposes. The £200m plan to build a bridge covered with trees over the River Thames was abandoned following Dame Margaret’s review, which was published in April.